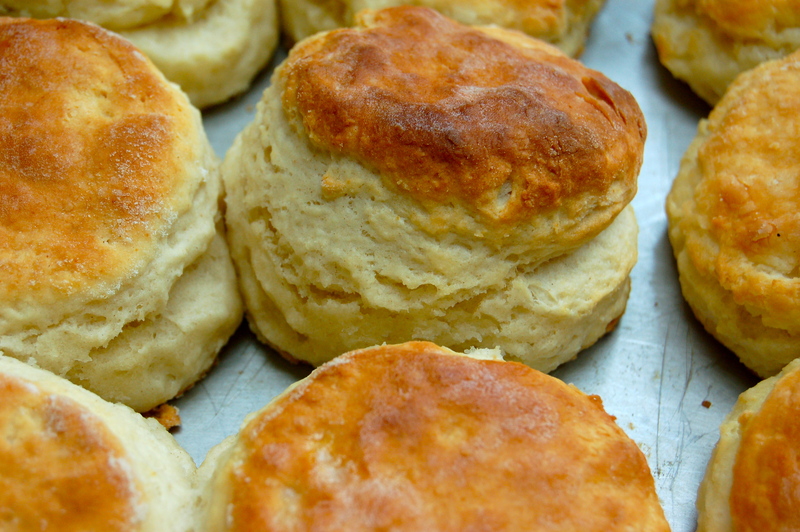 What’s The Secret to a Perfect Biscuit? I’ve been asked quite a bit about biscuits these past few months. Folks pull me aside at book-signings. 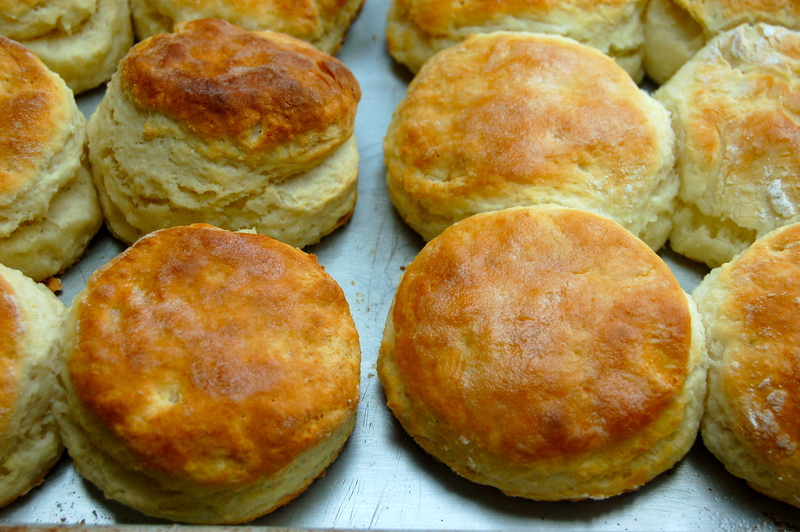 As I am spending the summer in New England, random folks hear my accent and ask about Southern biscuits. People reach out on Twitter and Facebook. I also get at least a couple emails a week asking about how to make biscuits. I love biscuits and I am not alone. I have a fantasy of opening a street-front, window only walk-up restaurant in NYC and sell nothing but biscuits and grits. It’s not that I think that there are that many displaced Southerners in NYC. No, not at all. It’s that everyone loves biscuits. Those folks may think they like bagels, but in my opinion, they just haven’t met the right biscuit. 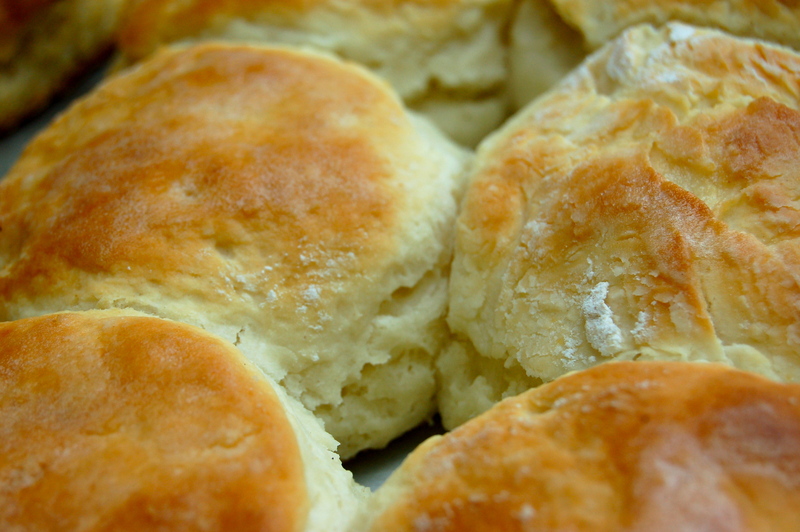 There’s no doubt in my mind that nothing says comfort like a fluffy, buttery biscuit. I am talking about flour, fat, liquid, leavener, and salt. A few weeks ago I gave an impromptu biscuit making class. We made biscuits side by side with two kinds of flours. In the photograph below, Gold Medal All Purpose flour is on the left, and White Lily All Purpose flour on the right. See the difference? Wheat flour contains two proteins, glutenin and gliadin. When you combine flour with water, the proteins create a strong and elastic sheet called gluten. Flours vary in their protein levels, which affects the texture of baked goods. Gluten gives structure to yeast breads, but is not recommended for tender cakes, biscuits, and quick breads. Southern all-purpose flour is milled from soft red winter wheat that has less gluten-forming protein. It is typically bleached, which makes it whiter, but this does not affect the protein. My family has always used White Lily flour, a staple across the South; another dependable Southern brand is Martha White. Most national brands of all-purpose flour are a combination of soft winter wheat and higher-protein hard summer wheat. White Lily contains approximately nine grams of protein per cup of flour, whereas national brands can contain eleven or twelve grams of protein per cup of flour. If you live outside the South, White Lily is available online or in some specialty shops in other parts of the country. For results similar to those of Southern flour, substitute one part all-purpose flour and one part cake flour for the amount of Southern flour in a recipe. Finally, high-protein flour absorbs more liquid than does low-protein flour; if you attempt to make biscuits with a high-protein flour, you will need to add more liquid. 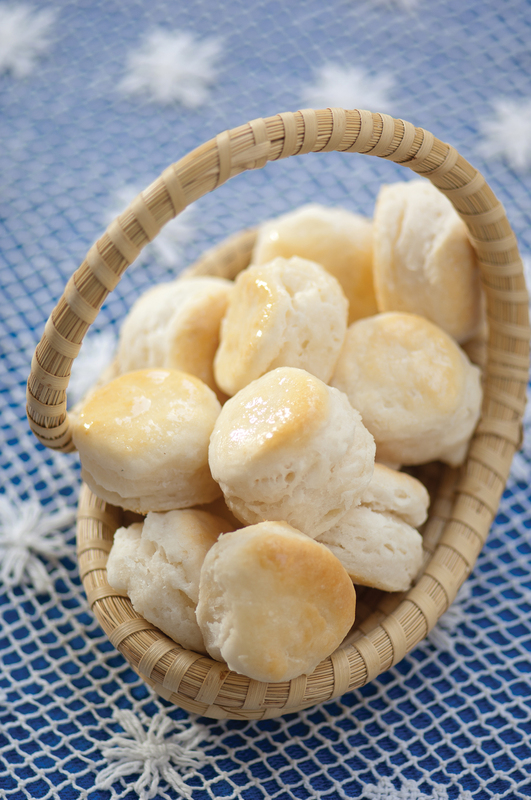 Want to know just how easy it is to make mouth-watering, buttery biscuits? Want to know how to have hot, fresh, homemade bread on the table in minutes? Want to perhaps find your lost recipe? Well, I’ve got the book for you. 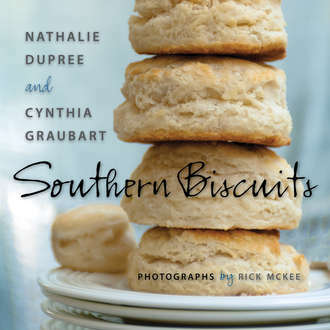 My friend and mentor Nathalie Dupree has just released a new book called Southern Biscuits she co-wrote with Cynthia Grauburt. It’s The Book on How to Make a Biscuit. Period. It’s the definitive biscuit book with recipes and secrets to creating every style of biscuit imaginable. It’s filled with amazing photographs including dozens of how-to photos showing how to mix, stir, fold, roll, and knead. It also explains what ingredients to use and how the type of flour, fat, and liquid affects the end result; how to cut, hand-shape, or scoop the dough; time and temperature. Like I said, it’s How to Make Biscuits. Period. The perfect biscuit should be golden brown and slightly crisp on the outside, with a light, airy interior. For a flaky, tender biscuit, don’t overwork the dough: gently combine the ingredients until just blended. I hope you enjoy this collection of recipes. Keep me posted on what you’re doing – both success and failure stories. Shoot me a comment or email. I’m happy to try to help. Lastly, a couple of things to share since I am marrying my newsletter and blog. I’ve decided I should call this “Mama’s Reading List!” This week I was interviewed for USA Today about Georgia peaches and Roberta and Lois from Kosher Eye called to chat about Southern Food. And, please check out Lisa is Cooking to see what’s on my bedside table. Meme most often made rolled biscuits. For large biscuits, she had a special aluminum cutter with a small wooden handle that fit in the palm of her hand. She cut out small biscuits with an empty apple juice can open at both ends. Some purists use lard instead of butter. Although I like biscuits made with lard and understand the tradition and history, Meme and Mama had started using butter by the time I was born. variation: If I don’t feel like rolling out biscuits, or just want a different texture, I tweak the recipe by adding more buttermilk to the dough and make drop biscuits: use 3 cups of flour—2 for the dough and 1 cup placed in a bowl to shape the dough into biscuits. Increase the buttermilk to 2 cups. The dough will be very wet and resemble cottage cheese. To form the biscuits into balls, scoop up some dough with a large ice cream scoop; place the dough balls in the bowl with the 1 cup of flour. Working one at a time, roll the balls to coat in flour, then set in an ungreased 8- by 2-inch round cake pan. The baking time will be the same as for cut biscuits. Preheat the oven to 400°F.Bake or microwave the sweet potatoes until soft and tender, about 45 minutes in the oven or about 10 minutes in the microwave. Set aside to cool. When the sweet potatoes are cool enough to touch, peel and mash until smooth in a food processor fitted with a metal blade or with an old-fashioned potato masher. Measure out 1 cup and reserve the rest for another use. Line a rimmed baking sheet with a silicone baking liner or parchment paper. Set aside. In the same bowl of the food processor, combine the flour, sugar, baking powder, and salt. Pulse in the butter until the mixture resembles coarse meal. Combine the sweet potato and milk in a small bowl and whisk until smooth. Add the potato mixture to the flour mixture, pulsing just until moist. Turn the dough out onto a lightly floured surface; knead lightly four or five times. Using a lightly floured rolling pin, roll out the dough 3/4 inch thick. Cut out 10 biscuits with a 2-inch biscuit cutter, pressing the cutter straight down without twisting so the biscuits will rise evenly when baked. Place the biscuits on the prepared baking sheet. Gather together the scraps (by placing the pieces on top of one another in layers instead of bunching it up). Roll out 3/4 inch thick. Cut with the biscuit cutter into 5 or 6 more biscuits. Place the biscuits on the prepared baking sheet. Discard any remaining scraps. Bake until lightly browned, about 15 minutes. Transfer the biscuits to a wire rack to cool. Serve warm or at room temperature. Yogurt makes a very light, tangy biscuit. With homemade or commercial self-rising flour, it is a simple matter. Yogurt varies in consistency, from the thick cream-topped to the thinner generic brands, so it is always a judgment call as to how much to use to make a wet dough. Do not be tempted to use nonfat or light yogurt as they have additives that will change the nature of the biscuit. But if the yogurt is so thick you can’t incorporate it, feel free to add a bit of milk or buttermilk. These crisp biscuits triple in size and cut easily. Preheat oven to 450 degrees F. Select the baking pan by determining if a soft or crisp exterior is desired. 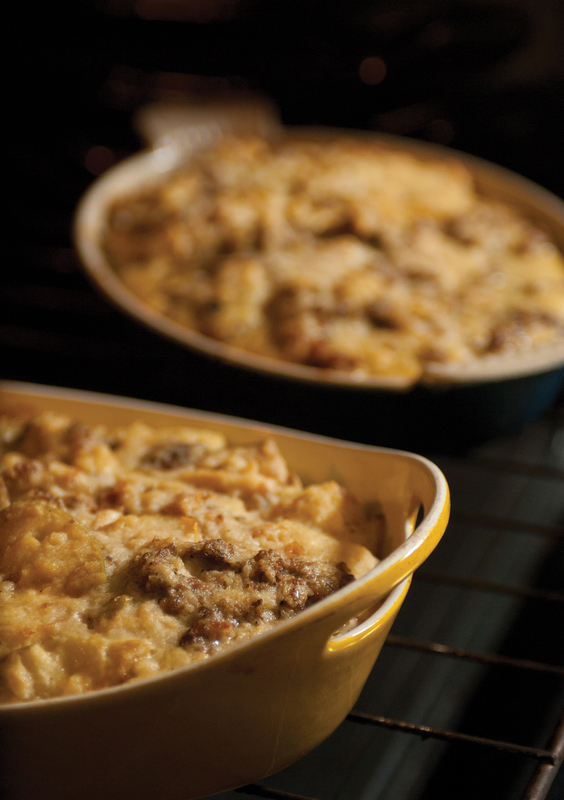 For a soft exterior, select an 8- or 9-inch cake pan, pizza pan, or oven-proof skillet where the biscuits will nestle together snugly, creating the soft exterior while baking. For a crisp exterior, select a baking sheet or other baking pan where the biscuits can be placed wider apart, allowing air to circulate and creating a crisper exterior, and brush the pan with butter. Fork-sift or whisk 2 cups of flour and the salt in a large bowl, preferably wider than it is deep, and set aside the remaining 1⁄4 cup of flour. Make a deep hollow in the center of the flour with the back of your hand. Pour 2⁄3 cup of yogurt into the hollow, reserving the 1⁄3 cup yogurt, and stir with a rubber spatula or large metal spoon, using broad circular strokes to quickly pull the flour into the yogurt. Mix just until the dry ingredients are moistened and the sticky dough begins to pull away from the sides of the bowl. If there is some flour remaining on the bottom and sides of the bowl, stir in 1 to 4 tablespoons of reserved yogurt, just enough to incorporate the remaining flour into the shaggy wettish dough If the dough is too wet, use more flour when shaping. biscuit, and 1-inch-thick for a giant biscuit. Brush off any visible flour from the top. For each biscuit, dip a 2-inch biscuit cutter into the reserved flour and cut out the biscuits, starting at the outside edge and cutting very close together, being careful not to twist the cutter. The scraps may be combined to make additional biscuits, although these scraps make tougher biscuits. Using a metal spatula if necessary, move the biscuits to the pan or baking sheet. Bake the biscuits on the top rack of the oven for a total of 10 to 14 minutes until light golden brown. After 6 minutes, rotate the pan in the oven so that the front of the pan is now turned to the back, and check to see if the bottoms are browning too quickly. If so, slide another baking pan underneath to add insulation and retard browning. Continue baking another 4 to 8 minutes until the biscuits are light golden brown. 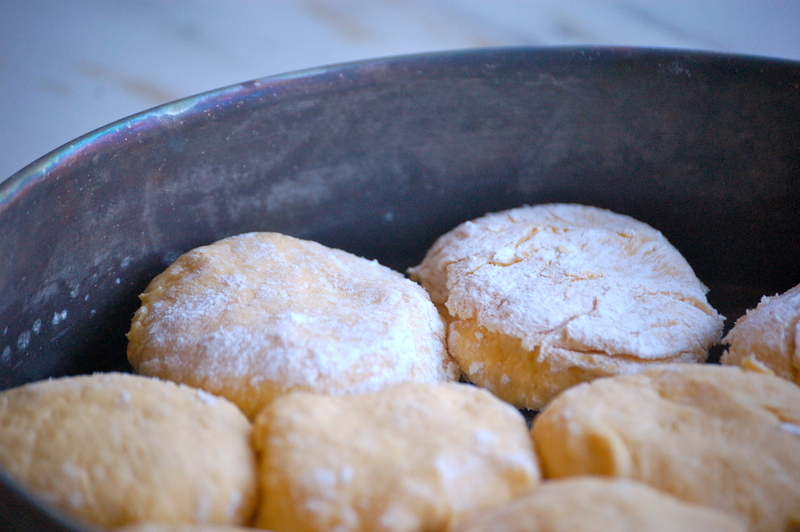 When the biscuits are done, remove from the oven and lightly brush the tops with softened or melted butter. Turn the biscuits out upside down on a plate to cool slightly. Serve hot, right side up. There is no sense doing this by hand when a food processor is available, making it easy and stress-free. Pulse together the cream cheese, 2⁄3 cup of butter, and 1 cup of the flour two or three times in a food processor fitted with the knife or dough blade. Turn the dough out onto waxed paper and divide into two rounds. Wrap in waxed paper, plastic wrap, or a resealable plastic bag, and refrigerate for at least 30 minutes. When ready to bake, preheat oven to 425 degrees F. Lightly sprinkle a board or other clean surface using some of the reserved flour. Sprinkle the top lightly with flour. With floured hands and a floured rolling pin, roll out one portion of the dough at a time to approximately 1⁄2 inch thick. For each biscuit, dip a 1- to 1 1⁄4-inch biscuit cutter into the reserved flour and cut out the biscuits, starting at the outside edge and cutting very close together, being careful not to twist the cutter. The scraps may be combined to make additional biscuits, although these scraps make tougher biscuits. Using a metal spatula if necessary, move the biscuits to an ungreased baking sheet, placing the biscuits 1 inch apart. Bake the biscuits on the top rack of the oven for a total of 10 to 12 minutes until light golden brown. After 6 minutes, rotate the pan in the oven so that the front of the pan is now turned to the back, and check to see if the bottoms are browning too quickly. If so, slide another baking pan underneath to add insulation and retard browning. Continue baking another 4 to 6 minutes until the biscuits are light golden brown. When the biscuits are done, lightly brush the tops with melted butter. Turn the biscuits out upside down on a plate to cool slightly. Serve hot, right side up. These biscuits may be frozen, unbaked or baked, and reheated. Sausage and apple is one of my favorite food combinations, and I find ways to cook it into everything from quiches to this soufflé-like casserole, great for a brunch or long weekend. Fry the sausage in a skillet, breaking it up as it cooks, and drain on a paper towel. Reserve the fat and let the sausage cool. Sauté the apples in the reserved fat, remove from pan, and let cool. Move the biscuit pieces to a large resealable plastic bag. Whisk together the eggs, mustard, cheese, and milk in a large bowl. Stir in the sausage and apples. Season to taste with salt and pepper. Transfer the mixture to the plastic bag. Place the bag inside another resealable plastic bag with the zipper facing another direction in order to prevent leaks. Refrigerate at least 2 hours, preferably overnight or up to 2 days. When ready to bake, preheat oven to 350 degrees F. Pour mixture into a buttered 13 x 9 x 2-inch baking dish or divide between two 1 1⁄2-quart casseroles. Bake covered 30 minutes. Uncover and bake another 30 minutes until eggs are set and the center measures 200 degrees F on an instant-read thermometer. photos for Meme’s Biscuits and Sweet Potato Biscuits are by me. I make biscuits all the time but NEVER thought about the flour I use. What an eye opener. Thanks for these tips. It’s a very tender flour — so okay for cakes, not as good for cookie and breads. Thanks so much for reading! I absolutely ADORE this post and it’s an “art” I dream of perfecting. With your help of course, Ms. Willis. I look forward to meeting you in ATL on Sept. 30th at Cook’s Warehouse! YAY! I loved writing it – thanks for sharing! You teach me something new with each contribution! Thanks…and I knew White Lily was the best! I could write a book on biscuit making — but no need with Nathalie’s! I’m confused about the Carolina Biscuits. It says to reserve 1/4 cup flour and 1/3 cup butter but they’ve already been used up (1 cup flour, 2/3 cup butter) in the food processor. So is there an additional amount of flour and butter needed or should the dough contain 3/4 cup flour and 1/3 cup butter? Thanks for sharing your secrets about biscuit making. I know the first ones I ever made were doorstops. I’m getting better but still no expert. Practice, practice, practice! Nathalie emailed me this morning. We’re not reserving. Thanks for the heads up and thanks for sharing. So glad to have found your blog. I have your cookbook and have enjoyed reading it and cooking several things out of it. What a dreamy post! I want to try the hollings biscuits and get this book. 🙂 happy weekend, Virginia! Always good to hear from you. If you bake them, please send me pics. This makes me want to make biscuits this very minute. (Rick McKee’s photos are also stunning!) I am going to make Nathalie’s Sausage and Apple recipe with the local Neese’s sausage we get in Charlotte, NC. Beautiful blog, Virginia. Nathalie loves sausage and apples. Thanks for reading! I credit all of my biscuit making success to my 10 years in the South; the love and attention to biscuits spoiled me forever. And now you have too…thanks so much for the recipes. I realized a few weeks ago after buying a flour I had never bought before, White Lily would be in my cabinet from now on. Those biscuits just tasted flat, not like my normal biscuits. Thanks for the explanation. It makes perfect sense that the type of flour would affect the biscuits, though I hadn’t thought of it before. It’s the same when you make fresh pasta! OK, so now I’m torn. Which biscuits should I make–Meme’s biscuits? or your buttermilk angel biscuits? 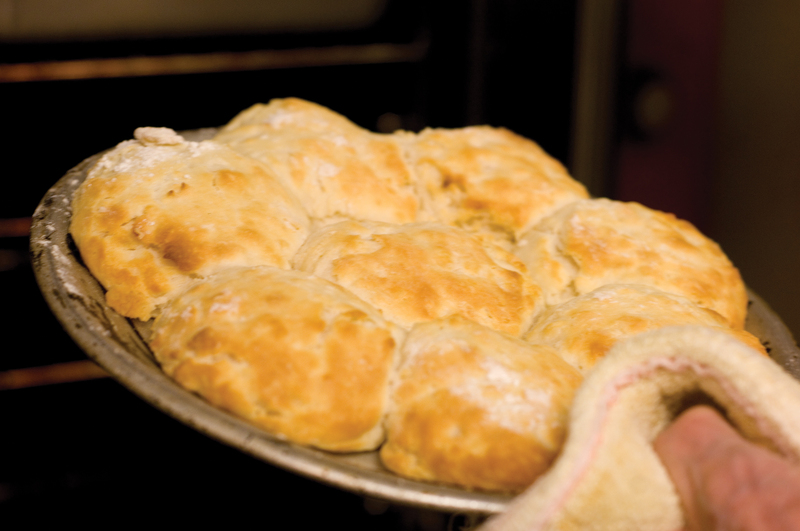 I grew up watching intently as my grandmother made wonderful southern biscuits. Love this post and I must try the Carolina biscuits, the cream cheese is very intriguing! What a wonderful post Miss VA! You are sooo talented! Had to send it on to Anna, my nearly 21 yr old granddaughter, who also loves to cook and will be entranced by this blog! Can’t wait to get word of your new book’s availability! I made those Meme’s biscuits a couple of weeks ago, and they were the best biscuits I have ever made, and have ever eaten. I used salted butter and put in a pinch of salt, and followed the recipe exactly. I can’t wait to make them again, and can’t wait for your new book! I just made Senator Holling’s Carolina Biscuits, and I’m wondering if the proportions are correct. None of them raised at all, and I’m certain that 1) my baking powder is good, and 2) I did not twist the cutter while cutting. Also, a few of them quite literally melted on the pan. Did I perhaps not mix them well enough? Thanks so much for any advice you might have. I’m curious, did you happen to hear from Nathalie on this particular biscuit? My experience with these and I’ve tried twice now, is very similar to Cassandra’s. They didn’t raise much at all (and I noticed in Nathalie’s utube video that hers didn’t rise much either). The photograph that they have ran with this recipe depicits a biscuit of which I could eat the basket full, but I haven’t yet been able to recreate these biscuits. I would love to make these but I’m a little resistant from the comments about the measurements and the biscuits not rising. Can someone please get back to us regarding this recipe. Also were the biscuits made with White Lily Flour?? M husband emailed me this article, knowing I would be all over it. Biscuits are one of my most fave foods ever! I have now requested the book and will track you down to follow the blog/newsletter. I learned how to make biscuits form my grandma using one bowl in a pool of flour about 50 ys ago..these are beautiful..thank yu for this gorgeous post..I appreciate the beauty in it! Would love to have the book in my library. I so enjoyed the Author Event. I am looking forward to putting your cookbook to use. You touched my heart with the introduction of your newest book yesterday. I even became teary eyed – I still have my maternal grandparents (they are aging quickly) my grandfather was the gardener and my grandmother was always working in the kitchen however; she did love to hoe in the garden. My paternal grandmother is still living at 94 but unable to cook the fabulous meals I so remember as a child. My mother learned to cook from several wonderful southern cooks and the same has been handed down to me – I love to be in the kitchen. Thank you again – and I love the new cookbook and style and format you wrote it in makes it more personal. I wish you all the BEST! I love biscuits. But how do you get them to look so golden brown on the top like in the picture? Mine are always sort of pale and speckled. Should I bake them longer? They are already baked for about 15 minutes. I wouldn’t want them to dry out. I’ve also tried brushing them with butter or with milk before baking. Nothing seems to work- still the same pale speckles.